Happy New Year's Eve! I am staying indoors for the first time in years because the breakout I thought was acne is actually an infection I caught after travelling to flood-infested areas three weeks ago. My GP did a swab and culture - I'm running a temperature and have withdrawn from public life for the next three weeks. This was one of the most difficult posts of 2015 for me - narrowing down my favourite eyeshadow palettes of the year to just 10. I had to leave out some favourite staples such as Cargo Cosmetics Summer in the City and MUA Spring Break. 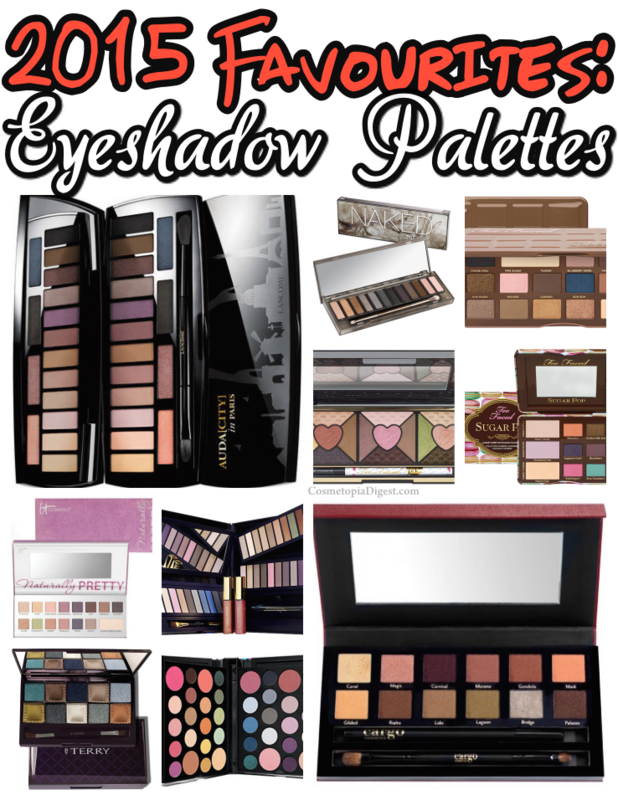 Scroll down for the list of my 10 favourite eyeshadow palettes for 2015. Disclaimer: Favourites lists are entirely subjective. What may be an awesome product to one person may not work at all for another. 1. Too Faced Semi Sweet Chocolate Bar, reviewed here. I actually liked this even more than the original Chocolate Bar palette (reviewed here) because - caramel tones. Now I've got the Chocolate Bon Bons palette unexpectedly for Christmas - review coming soon. 2. IT Cosmetics Naturally Pretty Vol. 2 Romantics, reviewed here. IT Cosmetics makes the most consistently impressive mattes I have seen so far. I love this palette as much as their original Vol. 1, reviewed here. 3. Lancome Auda[City] in Paris, reviewed here. I know there are mixed thoughts on this one, but I love the soft shades in here, and they work very well for me. I suppose this is one of those palettes with a bit of a learning curve. Avoid if you like bolds. 4. Cargo Cosmetics Venice Enchantment, reviewed here. One of the worst things about this post was having to choose between Venice Enchantment and the beautiful golden Summer in the City, reviewed here. Burnished golds vs. burgundies. In the end, the latter won. Mind you, a whole gold neutral palette is a must-have as well. 5. Too Faced Sugar Pop, reviewed here. The macaron packaging has my heart - and stomach. I particularly love the peachy shade, though I confess to neglecting the pink eyeshadow. 6. Urban Decay Naked Smoky, reviewed here. This one grew on me. Initially, I had my doubts about how some of those greyish shades would go on my skintone. Now I prefer this to both Naked 1 and Naked 2. Shocker, innit? 7. Smashbox Art. Love. Color. Master Class III, reviewed here. This palette wins the "most comprehensive" award. It contains everything - 32 eyeshadows, 8 blushes and highlighters, look cards.... and the pigmentation is not compromised, as you can see from my review. 8. By Terry Eye Designer Palette 3 Magnet'Eyes, reviewed here. While I struggle to justify spending $90 on a 10-pan palette, this was a nice luxury treat. What is special about this palette is all the gorgeous teals in here. I cannot compare it to Viseart because I will only be getting my first Viseart palette in 2016. 9. Estee Lauder Color Portfolio, reviewed here. I love two things about this set - the soft shades, and the fact that you can pop these out and customise a small 10-pan palette for travelling. 10. Too Faced Love Palette, reviewed here. This was a unique palette because in terms of the formula. The "slurry powder" has great pigmentation and glides on like a dream. What are your favourite palettes from 2015? Tell me in the Disqus comments widget below.